I was fortunate enough to be invited to speak at the launch of Kiama Council’s new Kiamasphere web site on Thursday. If you’ve been following this blog for a while, you’ll probably know that our sustainability journey really got going when my family joined the Sustainable Illawarra Super Challenge. It gave us the impetus to stop thinking and start acting on the changes we wanted to make. The Sustainable Illawarra web site contains a lot of valuable information and resources to help people learn more about living sustainably in the Illawarra region. With that project coming to an end later this year, the web site’s future was up in the air. A proposal was put to the three Councils involved (Wollongong, Shellharbour and Kiama) to keep it online for a relatively small sum of money. Unfortunately, Kiama was the only council willing to pay, so the proposal didn’t go ahead. Since the content developed belonged to the three councils, Kiama decided to take all the general information and the Kiama-specific content, and repurpose it as the Kiamasphere site. I think it’s great that all that hard work has been saved from the bit-bucket. Kiamasphere has also been enhanced with a FreeCycle-style service (named “Up4Grabs“) for residents to give away stuff they no longer want or ask for things that others might be throwing away, and more additions are in the works. 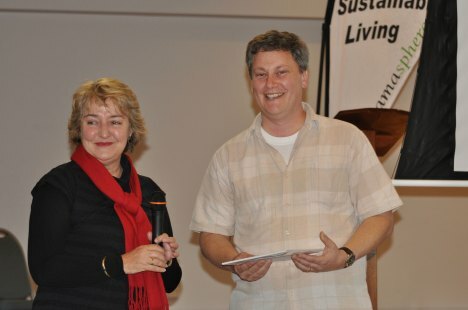 Council also took the opportunity of the event to present this year’s health and sustainability grants. Two local schools, Kiama Public School and Ss Peter and Paul Primary School, were awarded funding to develop no-dig vegetable gardens and composting systems. The Kiama Netball Club was awarded funding for training and development of coaches. The Green Box cooperative was awarded funding to develop their brand and help get the coop off the ground. This one is a particularly exciting initiative, and I’m really keen to see them succeed. They have the potential to really develop local food production. I got my web site up on the big screen for all to see! Kiama Mayor Sandra McCarthy presented me with a copy of the book “Beyond The Blowhole” as a thankyou gift. I’d wanted that book for a while! Thanks to my mate Darcy Moore for the photos! You can read his write-up on the event here. My talk at the launch was basically about how the Sustainable Illawarra project has helped my family’s efforts to live more sustainably. It’s easy to feel helpless about all the problems going on around the world, from fisheries collapse and climate change to peak oil and rising sea levels, to name but a few. Sites like Sustainable Illawarra and Kiamasphere bring those larger issues into a local perspective, providing practical information and ideas for things we can all do, and highlighting the resources that are available in our area to help us. They reduce the feeling of hopelessness, and replace it with community response and personal action. Networking with like-minded people in the local area is a source of inspiration and motivation, and restores a sense of optimism about where we might be heading. With the Sustainable Illawarra project’s funding coming to an end, the constant stream of workshops we’ve been enjoying in this region over the past few years will also be ending. With local councils facing rate rise restrictions, tight budgets and ever-increasing burdens imposed by state and federal governments, there simply isn’t the money to continue them in the same manner. We’re now at a time where community groups need to step in and take over some of that community education role. 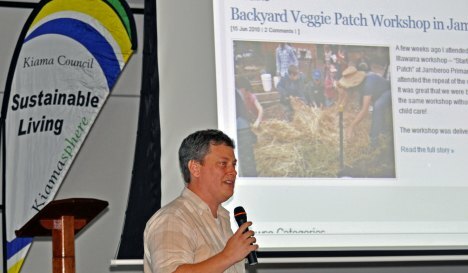 For example garden clubs can hold composting workshops, CWA groups can hold preserving workshops, Slow Food groups can hold cooking workshops, climate action groups can hold electricity efficiency workshops, and so on. Councils have the profile and contacts to help publicise community events, and hopefully can help to provide affordable venues as well. But volunteers are needed to organise them – you can imagine how much it would cost Councils to stage regular workshops if they have to put everything out to tender and pay commercial rates for everyone involved. Councils and community groups can work together, drawing on the strengths they each bring to the table, to get things done. We can’t just sit around waiting for someone else to do everything. If you live in the Illawarra region, I encourage you to check out Kiamasphere and register to be involved in the forums and the Up4Grabs service. Let me know what you think! Darcy has mentioned your work a number of times; well done. Recycling at Saurday Morning community based sport is generally poorly done. Hard working committee members sellthe drinks for a profit; but the rubbish is formidable. Kiamashere could history by geting organised and promoting car pooling, healthy canteen food and recycling at Council venues!! @Andrew: Thanks! The topic of recycling and waste minimisation at Council sporting fields has come up in the Kiama Health and Sustainability Advisory Committee before. It’s a difficult topic to address for a number of reasons, but we’ll continue to push for it. What were you able to achieve in the Shoalhaven area?